Live at International Amphitheatre, Chicago, USA, Sept 1, 1973. The album Love, Devotion & Surrender was like a bolt from the blue - a rocker with Top 10 albums to his credit with a critically acclaimed jazz guitarist - doing an album of John Coltrane covers and "transcendental music". 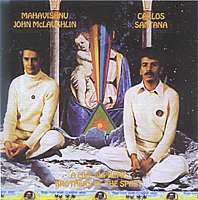 The album reached gold and sold over 100,000 albums but failed to give Carlos Santana another Top 10 album. He was also looked at with skepticism for his conversion to Sri Chinmoy, his new short back and sides haircut and his vegan lifestyle. But mostly, critics were unimpressed with Love, Devotion & Surrender. On hindsight, most have come around to the view that this was a good but maybe not great album. 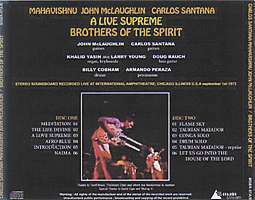 It reprised what McLaughlin was already doing with his Mahavishnu Orchestra  lightning fast riffs, endless soloing and numerous epiphanies. The difference was Santanas Latin-Cuban touch and melodic playing that contributed to the rock portion of this jazz-rock fusion. It heralded his entry into jazz and avante garde music which he would explore for the next few years. Sri Chinmoy also gave Santana discipline and that has helped him mature more as a survivor. 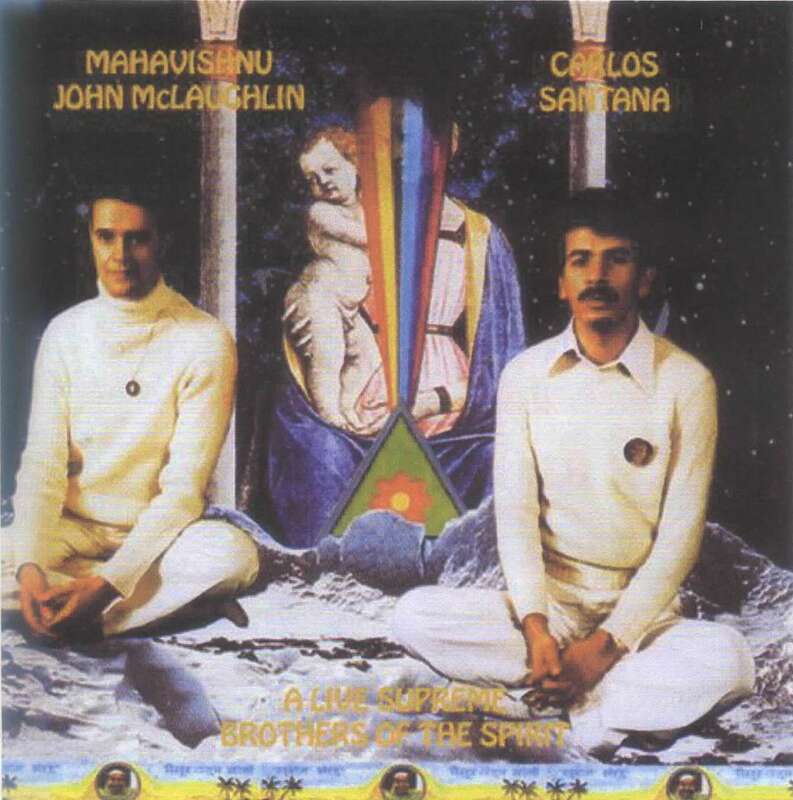 Attempts to follow McLaughlin/ Santanas brief resulted with an oversupply of jazz-fusion in the 80s that first led to jazz-lite lounge music and then opened a door into New Age. All rest and relax with no fire and no passion. Here is a live presentation from that brief tour in support of Love, Devotion & Surrender. This is a very good to excellent soundboard recording of a typical show taken from the Japanese Mainstream label. Scorching. Note: Due to the size of some of the files, please be patient when downloading the tracks. 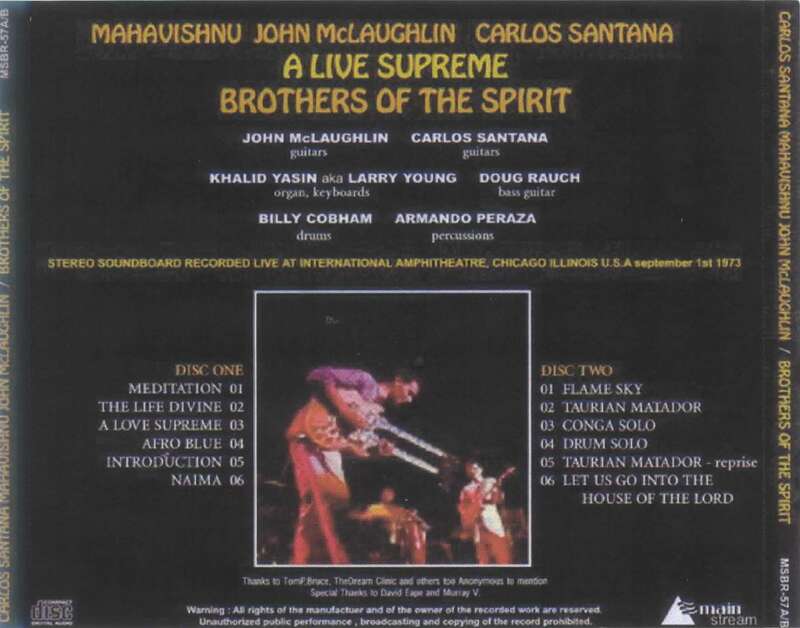 The lineup - John McLaughlin, Carlos Santana [gtrs]; Khalid Yasin aka Larry Young [keyboards]; Doug Rauch [bs]; Billy Cobham [drms] and Armando Peraza [percussion]. Click here to visit AllofMp3.com to buy a copy of Love, Devotion & Surrender.